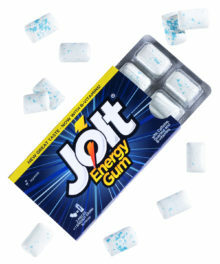 Suckers are delicious while they last, but you’re left with an empty stick all too soon. 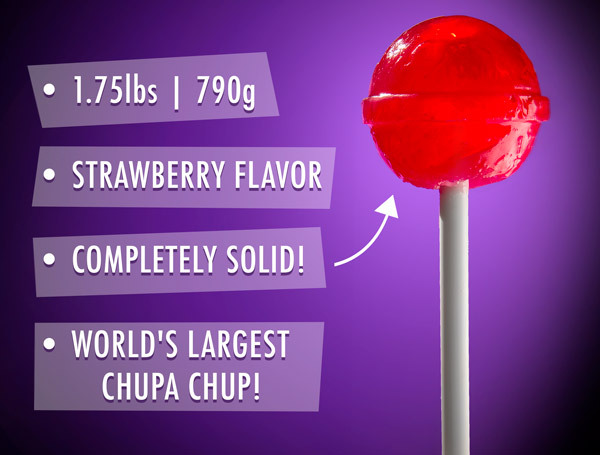 The Giant Chupa Chups Lollipop solves that problem—and then some! This prodigious pop is a completely solid strawberry sucker on a sturdy plastic stick. It has the same great taste you remember from the popular Chupa Chups suckers, just 65 times as much of it. The Giant Chupa Chups Lollipop is a ridiculously large version of a classic candy. 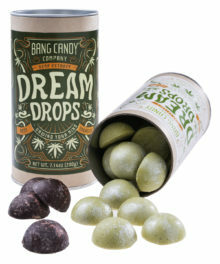 This gigantic treat is a completely solid hunk of hard candy made of 1.75 pounds of sugary sweetness. You’ll enjoy licking your way through the tasty strawberry sucker while marveling at its size. We recommend saving the wrapper, though, to keep it fresh between each tasting binge; with over 2,800 calories to devour, this one could take a while to finish. How many licks does it take to get to the center? Get back to us in a year. Many beloved things from childhood seem smaller when you’re an adult. This is one memory that got supersized. 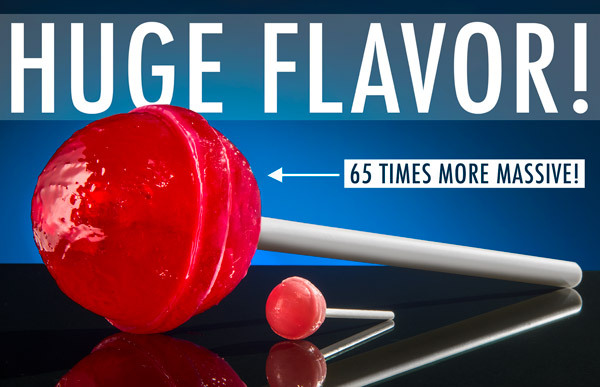 The Giant Chupa Chups Lollipop is 65 times more massive than the original fruity pop, and all that extra weight means you get more deliciousness to savor! It’s the big brother… the much, much bigger brother. The Giant Chupa Chups Lollipop achieves its eye-popping size without sacrificing any of the taste that makes Chupas so popular. 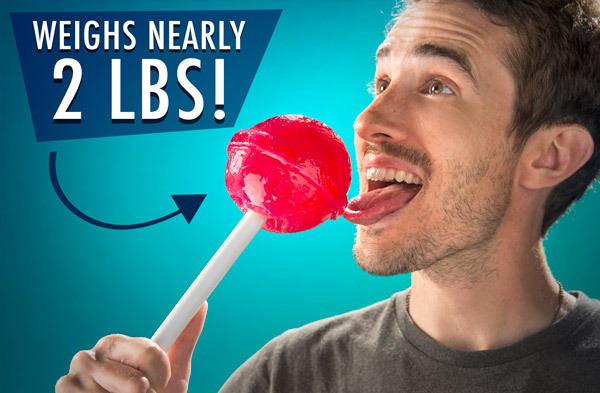 The large lollipop has 1.75 pounds of fruity strawberry flavor for you to enjoy. 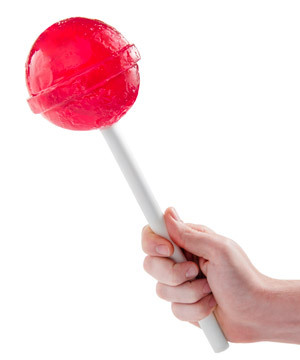 The hollow plastic stick (aka "the portability beam") keeps your sucker on straight and gives you a non-sticky handle for your massive treat. The wrapper bears the iconic Chupa Chups logo designed by none other than Salvador Dali. 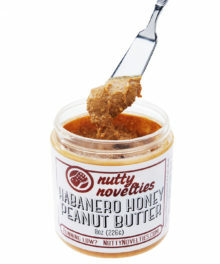 The term “single serving” never made sense to us. Question: If you accidentally inherited 100 of these giant suckers, what would you do with them? 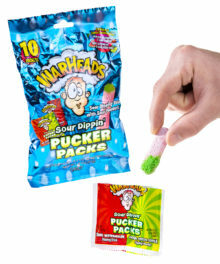 Question: I’ve never had a Chupa Chups. What does this taste like? Answer: The Giant Chupa Chups Lollipop doesn’t have a strange flavor. It’s a very flavorful, fruity strawberry sucker. Question: How long would it take to finish one of these? 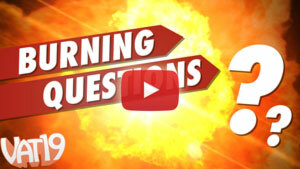 Answer: That depends on how fast you’re licking. To get a rough estimate, see how long it takes you to eat a regular-sized Chupa Chups, then multiply that by 65. Question: Why'd you make that licking video?